Pave Diamond – Paved in Sparkles! A Pave diamond is a a stunning yet still affordable alternative to plain the single-diamond setting. 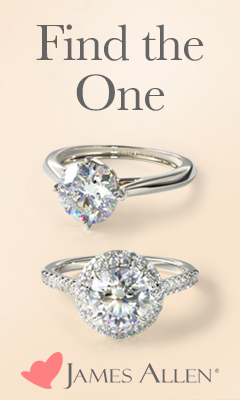 The perfect choice for those who want to go beyond the plain solitaire setting and add sparkle to the entire ring. Pave is pronounced as 'pah-vay' and also sometimes accented as pavé which takes its name from the French word for pavement. An appropriate name considering the small pave diamonds are set closely together without any partitions, thus resembling a dazzling cobblestone road paved around the frame of the ring or other jewelry piece. A ring may have pave diamonds exclusively but more often they are used to complement a much larger center stone in solitaire or bezel setting, particularly for pave diamond engagement rings. This gives the effect of a road of small sparkling diamonds leading up to a single stunning brilliant stone. The metal used for the ring can differ, although the usual choice is platinum or white gold to further enhance the sparkle of white diamonds. The diamonds are installed by the jeweler by boring small, narrow, conical holes in the metal side-by-side and putting the pave diamonds at equal level. Some jewelers put ornamental designs on the metal to complement the stones and enhance the beauty of the jewelry. Single band. The diamonds are set on a single row. This design may or may not have a center stone. Three-dimensional band. Two rows of diamonds are angled in order to support the middle row. 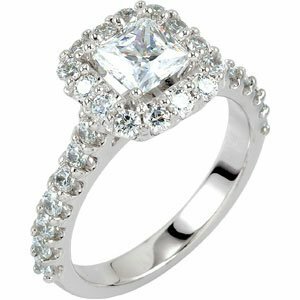 This design usually has a center stone that is slightly elevated to make it more visible. Half-pave. A half-pave setting, as the name suggests, has the diamonds going halfway around the ring. Full-pave. The full-pave setting has the diamonds going around the whole ring. The full-pave is usually the setting of choice for engagement rings. More sparkle: Compared to solitaire rings, pave diamonds are more sparkly, considering that there are many more diamonds embedded on the ring that will constantly be catching light from all angles. Affordability: A full array of pave diamonds can often be substantially less costly than even a single one-carat diamond. One reason for this is because pave diamonds are just a faction of a carat each and as single-stone diamond carat increases, the relative price goes up much more steeply. Another reason is that a pave diamond does not require as high a grade of clarity. Given the small size of the stones, it is quite difficult to see imperfections. That said, it is not hard to obtain very affordable pave diamonds with high clarity grades, simply due to their low carat weights. More convenient: Solitaire rings, particularly those with raised stones, have a tendency to get caught on things. This is not a problem with pave diamonds since the stones are laid flat. As with any diamond jewelry, when shopping for a pave diamond ring, be sure to purchase from an established source. Some shady establishments mix fake diamonds with real ones in this type of ring because due to the small sizes it can be difficult to detect the real stones from the fakes. Do clean your pave diamond ring regularly by soaking in warm water and mild liquid detergent or soap for several minutes. Do not use boiling water and avoid using harsh chemicals when soaking or cleaning a pave diamond ring as this can tarnish the metal of the ring. Do not scrub the surface of the diamonds unless absolutely necessary. If the sponge catches, it can cause a setting to loosen and the stone to fall out. Recommended: One in a while, bring your ring to a jeweler to check that the settings for each of the pave diamonds are still firm.